Un noeud de trafic densifié pour l’EuroAirport Basel Mulhouse Freiburg. Today’s airports aren’t anymore pure interfaces between ground and air. Since several years they are going through an intense development. Their ground and air accessibility attracts real estate development and (re-) links the region it is implemented in. The provoked economical development around the airport has impact on its catchment area and vice versa. The “EuroAirport Basel Mulhouse Freiburg” consists in an important regional airport, connecting its catchment area with Europe and is located at the borders of three countries. The present situation doesn’t include any rail connection even though tracks pass by about a kilometer from the terminal. The only access is by road and air traffic. My project aims at an improved accessibility of the EuroAirport – connecting different scales at one place. This new DENSIFIED MODAL INTERCHANGE includes a reorganization of the terminal layout. 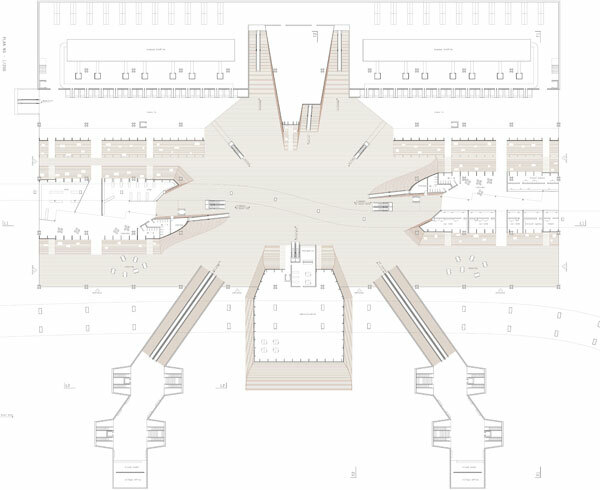 The old terminal (1970) is demolished and this new void within the existing terminal (20012 – 2005) marks the interconnected modes of transportation and lets the passengers experience their flows. The project adds a high speed train (HST) station and a Ringbahn stop connecting the site to the bigger region and the city of Basel. The train station takes advantage of its location at the crossing of important European HST axes and allows the site to keep the amount of passengers even when its short haul flights will be substituted to HST to free up air space for long haul flights in the coming future.